6:00pm ET Update: According to creator Richard Keith, Life Sentence is still not cancelled or renewed. A decision is due next week. See his update, below. It seems Stella Abbott’s second chance is over. The CW has cancelled its Life Sentence TV show after one brief season. The dramedy, from creators Erin Cardillo and Richard Keith, premiered with disappointing numbers on March 7, 2018, and promptly sunk to deathly low. The series is slated to air its season one and TV series finale episode on June 15, 2018. 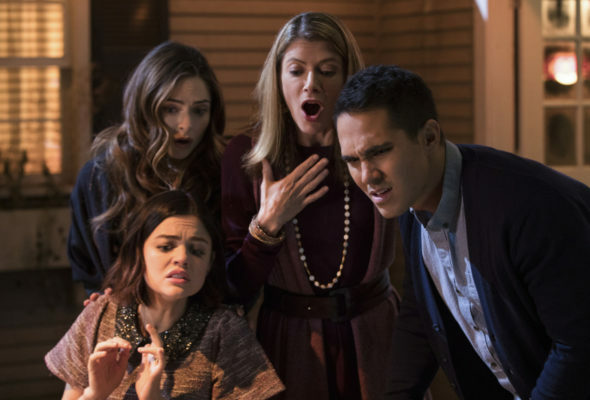 A CW Y/A series, Life Sentence stars Lucy Hale, Dylan Walsh, Gillian Vigman, Brooke Lyons, Carlos PenaVega, Jayson Blair, and Elliot Knight. The dramedy centers on Stella Abbott (Hale). After a lethal cancer diagnosis, she spent eight years living her life like any dying young woman might. After she learns she’s been cured, Stella must return to living like someone with a whole life ahead of her and help her loved ones to do the same. The first season of Life Sentence averaged a 0.15 rating in the 18-49 demographic and 511,000 viewers. Learn how Life Sentence stacks up against the other CW TV shows. THR has announced the Life Sentence cancellation. Today, we also learned The CW cancelled its Valor TV show after one season. Details here. UPDATE: After publishing this article, creator Richard Keith contacted us on Twitter. Despite a report to the contrary, Keith says that no decision has been made regarding a Life Sentence cancellation or renewal. Check it out. It hasn’t been cancelled. No decision will be made until next week. In the 2018-19 season, The CW is expanding its programming from five to six nights a week. The network may well decide it has room on the schedule, and let’s face it, they’ve been more than generous to shows like Crazy Ex-Girlfriend and Jane the Virgin. We’ll keep an eye on the situation and update with any changes. Keep your fingers crossed and stay tuned. What do you think? Did you enjoy the Life Sentence TV series? Should The CW have cancelled or renewed this TV show for a second season? More about: Life Sentence, Life Sentence: canceled or renewed?, Life Sentence: ratings, The CW TV shows: canceled or renewed? This a good series. Keep it going. Really disappointed with all the cancellations of goos series on the CW. Getting old. Please don’t cancel “Life Sentence! !” It is a wonderful show!!! Please don’t cancel “Life Sentence” It is a wonderful show!!! I really love this show its a beautiful story about love and crisis and i also think Stella and Dr. Grant should have been together earlier a story about them would be much cuter hes lost someone thru cancer and she had it they relate so much. Compared to Wes Grant is way better because Wes continued to lie to her and she married a man she didnt even know. Please dont cancel. A great show. One of best. Please don’t cancel…. its a really great show i think there should be another season. I have rather enjoyed it and hope that they do wrap things up properly at it’s end. But overall – it’s …cute! I really LIKE this show. It has a lot to offer. Lucy Hale is a terrific actress and is perfect in Life Sentence. I hope they’ll give it a chance to find it’s audience. It deserves a 2nd season. Well, it should be canceled, it’s horrible. That doe-eyed look is annoying, not cute.